There’s good reason for the network to think that Bob’s Burgers is going to succeed where Mulaney could not. Try as the latter might, it can’t find the right balance of absurdity and emotion that makes the former such a treat every week. There’s no better example of that than this week’s installment, which made its lead storyline about Bob’s relationship with his best customer, Teddy. The loveable galoot visits the restaurant after learning that if he doesn’t change his diet, he could face serious health risks. 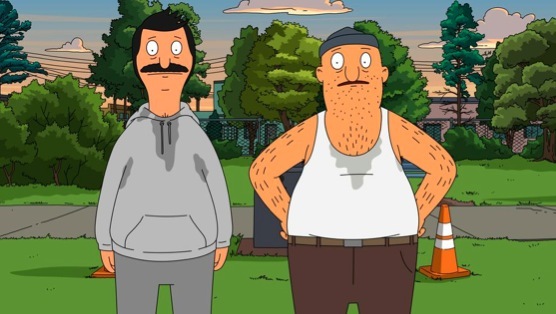 Poor Bob realizes he’s part of the problem, and tries to cut Teddy off from his hamburgers, and to help him lose some weight. This opens up a whole mess of questions about the nature of their relationship. Does Bob consider Teddy a friend, or just a customer? For as much as he insists that he values “that 30 inches of Formica between us,” Bob’s conscience and his big heart won’t allow Teddy to risk his life for the sake of a sandwich. And if that means insisting that they are best friends, well, so be it. That’s how the two men wind up at a stuntman training camp/exercise retreat where they are asked to jump through windows, roll down stairs, and run—all while being chased by “robots” as part of the regimen (“I want you to breathe out stress, and breathe in stunts,” one of the trainers says). It’s there that Bob fesses up that he only made those comments about being best friends to protect a customer’s health, which, of course, Teddy overhears. Whatever Bob may think about his relationship with Teddy, it’s obvious that he cares on some level. Why else would he try and stop his best customer from eating a Belt Buckle Belly Blaster—some gigantic burger—at a competing restaurant? They may not be best friends, but Bob’s humanity and heart at least allow them to remain close. And if it means getting shoved out of a real window by the proprietor of Dusty’s Feedbag, so be it. Compared to all that, the “B” Story here seemed to be a bit of a throwaway, but it was still a fun one. When the kids discover they can turn the floor of the walk-in freezer into a miniature ice rink, they end up engaging in a Thunderdome-style competition with the other kids in the neighborhood. While, of course, being dressed up in outlandish costumes and egged on by Linda. It’s a silly, silly, diversion but cut nicely through the melodrama of Bob and Teddy’s adventure.